In business for over six decades, the Frank Kapr Funeral Home is located on West Pittsburgh Street in Scottdale, Pennsylvania, southeast of Pittsburgh, PA. The funeral home offers pre-arrangement services, burial services, cremation services, and pet services. According to the Frank Kapr website, they “embrace all faiths, traditions, creeds, customs and honor the rights of everyone’s personal choice.” In 1997, the Frank Kapr Funeral Home was recognized as Scottdale’s sole funeral home member by the Selected Independent Funeral Homes. The production manager of ITSENCLOSURES resides near the funeral home and noticed their attempt to use a consumer-grade, indoor television outside of their building. The ITS employee spoke with Frank Kapr about a functional solution provided by ITSENCLOSURES, which includes a high bright LCD that is sunlight readable. Frank Kapr reviewed the ITSENCLOSURES website to get a better understanding of the enclosure company’s capabilities. The funeral home desired to show up-to-date, current signage on the front of the building to display obituaries and announcements. Frank Kapr was interested in a solution that would allow them to make changes to the signage instantly and revise content at their leisure. The original screen (intended for indoors) was mounted outdoors on the front porch railing. After preliminary testing, the television was found to be too dim and almost impossible to view during the day. Because of cold winters and sunny, hot summers, western Pennsylvania weather conditions were a concern. Thermal management was discussed to combat the temperature fluctuations throughout the year. Also, Frank Kapr desired to use digital signage around the clock, so the proposed LCD enclosure solution needed to be operational 365 days a year. Because the current system was difficult to see, the funeral home turned to ITSENCLOSURES for a better solution. 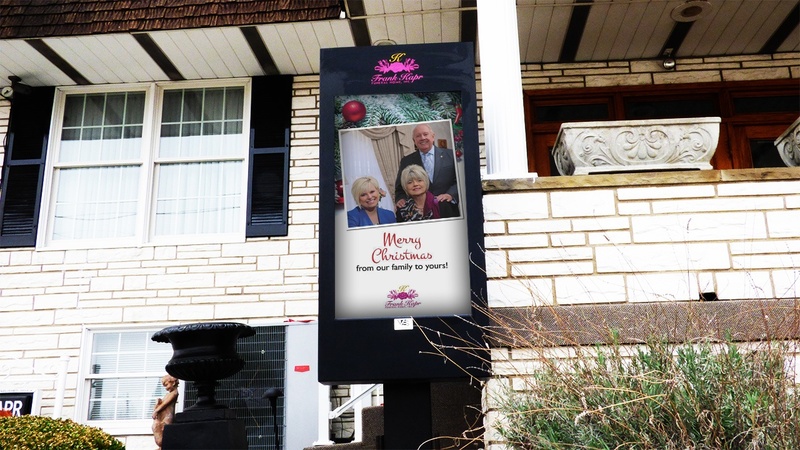 After reviewing digital signage choices with ITSENCLOSURES, the Frank Kapr Funeral Home installed an all-weather, LCD enclosure, in the flower garden, at the front entrance of the building. 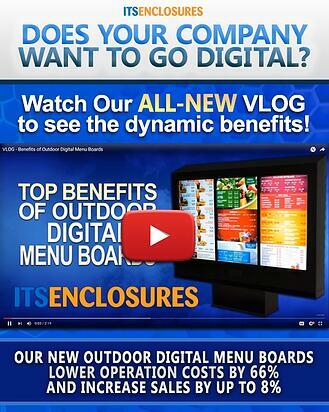 The digital signage displays brief obituaries and announcements/events for the Scottdale area. The LCD enclosure is mounted in portrait orientation and includes a 46” high bright LCD (1,500 nits), and a heating/cooling system to guarantee operation in temperatures of -40° to 120°F with direct sunlight exposure. To modify content on a regular basis, a small form pc/media player is hard-wired to a computer in the funeral home’s office. The enclosure is mounted on a cement footer, surrounded by flowers and greenery, and can be seen by those taking a stroll or driving past the building. Frank Kapr also had the funeral home’s logo silk screened on the enclosure for customization and brand awareness.